Angels There For You™ is devoted to improving lives in many ways, both within your community and through our contribution to child sponsorship throughout the world. In 2000, our CEO Patricia Cruz, along with five others formed Senior Link- Independent Living Society in response to the continuing government cuts to services for seniors, who often did not have a family member nearby and needed someone to speak for them. Today, the Canadian government continues to make these cuts and our organization continues to be as relevant as ever. Angels There for You™ uses its financial resources and time to support Senior Link. The organization recognizes that isolated seniors are some of the most vulnerable members of our society and this group will continue to grow in size into the future. Angels There for You™ also devotes funds to sponsor close to a dozen of children worldwide. We have worked with SOS Children’s Villages for many years and committed to growing the number of children we extend education and sustenance in their formative years. We participate in various annual celebrations that connect us with those we serve, our employees, and our community as a whole. On July 1st, we celebrate Canada Day. 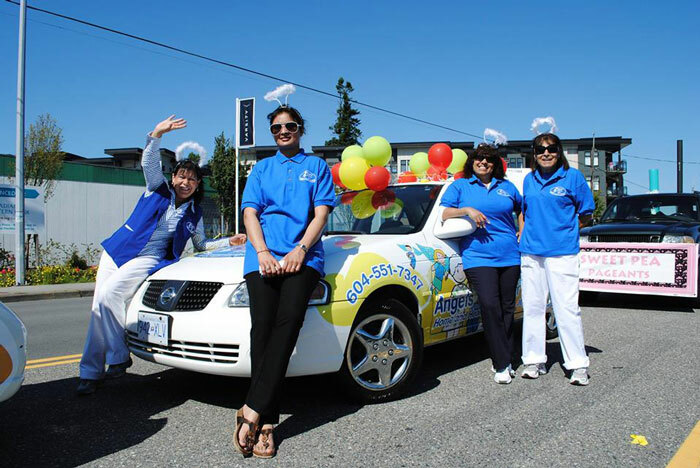 We have a reserved spot on Moncton Street in Steveston and our caregivers accompany our seniors to view the parade and celebration. After the parade, we invite our caregivers and clients back to the office for a free lunch. In October, we celebrate International Seniors Day. We invite all our seniors to come to the office for coffee, tea, juice, and baked goods. We also give out prizes and have a special cake. In December, in alliance with Senior Link we throw an annual Yuletide Buffet for the community. This event is open to the public and includes seasonal entertainment.